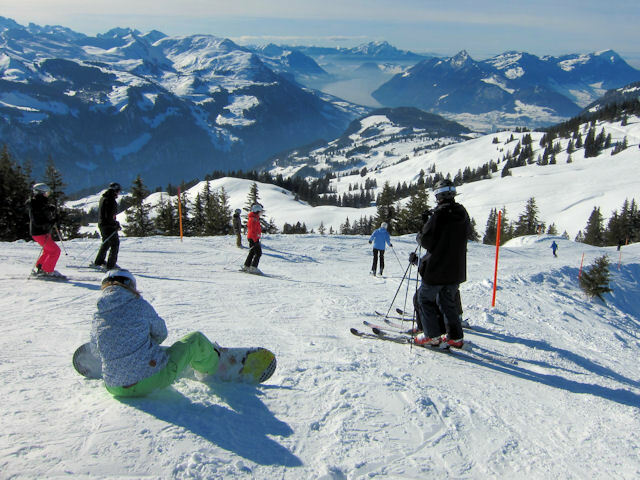 n the heart of the most traditional Swiss canton is one of its oldest ski areas and the location of the first Swiss Ski School. Hoch-Ybrig has a loyal following of friendly regulars and day-trippers from Zurich, less than two hours away by a combination of train and bus (via Wädenswil and Einsiedeln), and little more than an hour by car. Of the bottom stations Weglosen has the larger car park, but Laucheren is probably the easier to get to if you use the irregular bus service. Small lift queues can build up at weekends at the lift stations around Seebli, but they are nothing like skiers and snowboarders might experience in other countries. 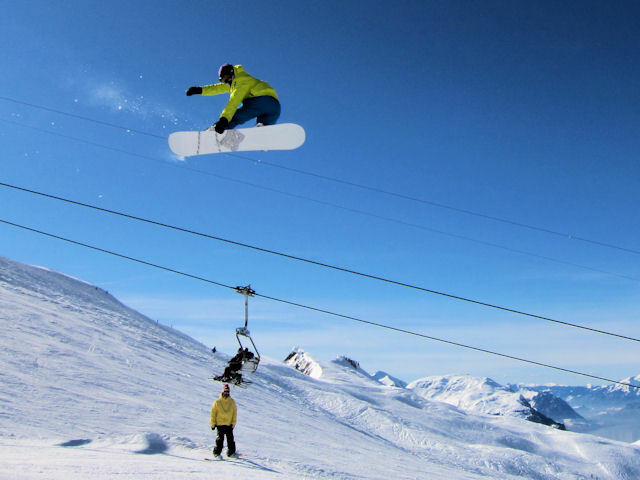 There is certainly enough variety to justify a day's outing or a weekend break for skiers or snowboarders, both on and off piste, and there is a very good park (with some huge jumps). 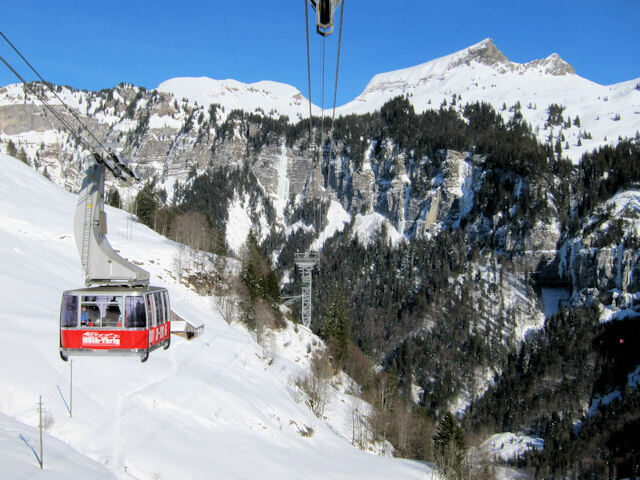 Apart from around the beginners areas, it is possible to get around the resort without using surface lifts - although there is one long but avoidable T-bar from Laucherenstöckli. There is a small, unconnected area for beginners at Oberiberg with two surface lifts. 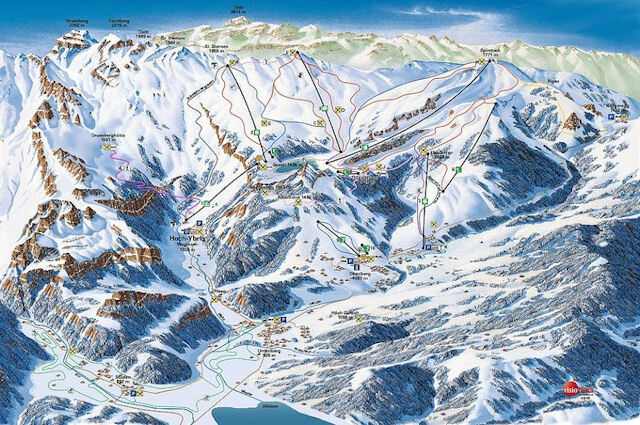 At Ibergeregg there is also a small area with two surface lifts and it is possible to ski down to it off the Spirstock, and then on down to Laucheren on an unprepared ski trail. The run to Talstation Laucheren from Spirstock is a 5km long red/blue run. 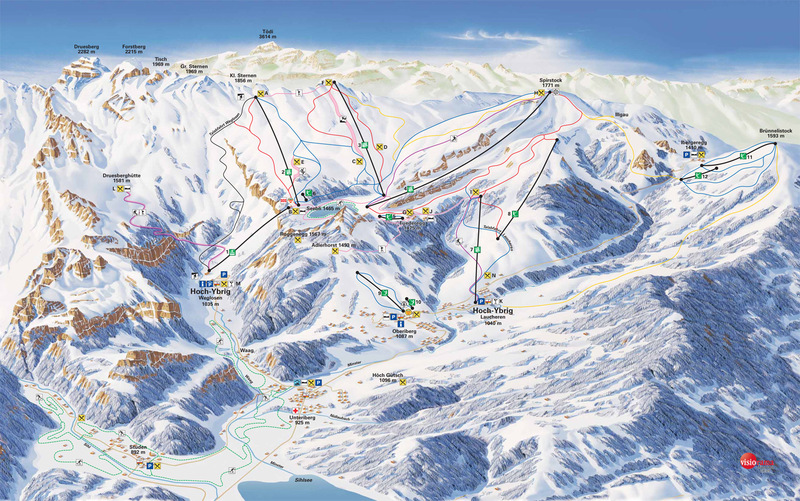 There is a fabulous black run down to Weglosen, which is the only resort run down to this bottom station but it is not a difficult black. From Spirstock there is a trail down to Ibergeregg which is flat in places but incredibly scenic and usually prepared. From the top of the lifts at Ibergeregg it is then possible to ski or snowboard back to Laucheren, but this unprepared trail is extremely narrow in places - the start of the trail is not well posted, so keep tight to skiers left after you exit the T-bar on the right. 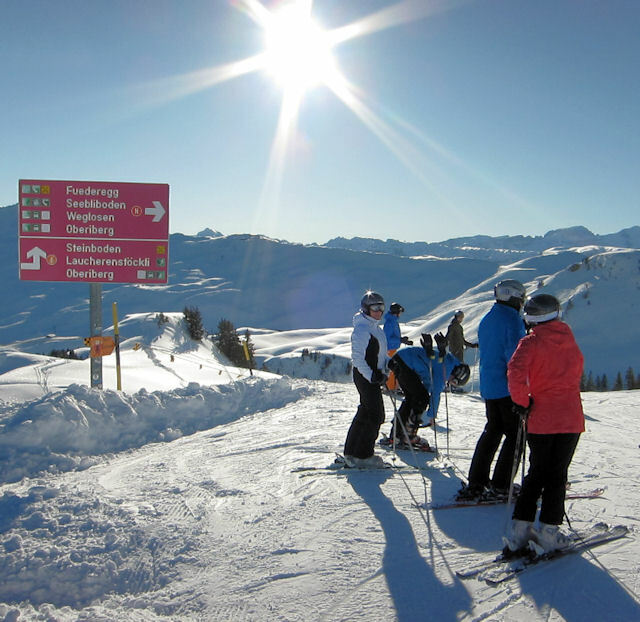 The best destination to access the downhill slopes by public transport in this ski area is Hoch-Ybrig, Talstation Laucheren or Weglosen. Bus stops adjacent to lifts. Note that the return buses from both bottom stations are infrequent and stop relatively early - at the time of writing respectively 4.45 and 5.23 from Laucheren and Weglosen. From Zurich the least travel time is 1 hr 28 mins with as few as 2 changes going via Wadenswil / Einsiedeln. From Basel the least travel time is 2 hrs 31 mins with as few as 2 changes going via Wadenswil / Einsiedeln. From Berne the least travel time is 2 hrs 38 mins with as few as 3 changes going via Zurich / Wadenswil / Einsiedeln. The road distance from Zurich is around 59 km and the journey time is roughly 1 hr 10 mins. The road distance from Basel is around 143 km and the journey time is roughly 2 hrs. The road distance from Berne is around 184 km and the journey time is roughly 2 hrs 20 mins. The road distance from Geneva is around 347 km and the journey time is roughly 4 hrs 10 mins. Nearby destinations in the region include Ibergeregg, Mythenregion, Stoos and Sattel-Hochstuckli.